BBM Has Officially Relaunched Today For Both Android & iOS : Free Download Now. Home » Uncategorised » BBM Has Officially Relaunched Today For Both Android & iOS : Free Download Now. Finally they launched it. Blackberry Messenger or BBM has officially relaunched today in both iOS and Android platform. 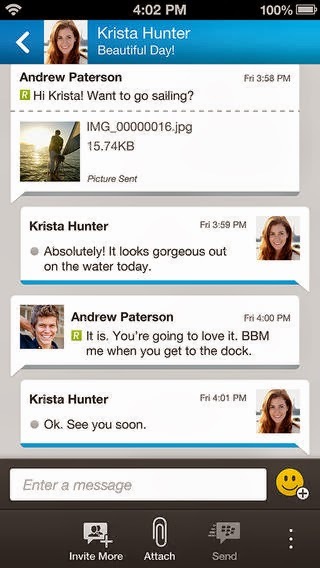 Though they made quite mesh up to launch it as first BBM was launched in iOS platform for iPhone user. And the Android version of BBM app was first launched in New Zealand Google play store. But at this moment some bug were found in that app so they immediately pulled up it form Google store. At this time this apk was spaded in the whole world and everyone was free downloading BBM APK for Android. And they also removed it from iTune store. After lots of experiment and bug fix finally toady they officially relaunched the most anticipated messenger BBM on both Android and iOS platform. So if you have a iPhone or Android device then you can grab this awesome messenger BBM for free. BBM has already launched in iTune store while the Android version still rolling out. So we will provide you the official download link of BBM as soon as its available on Google Play. So stay tuned.